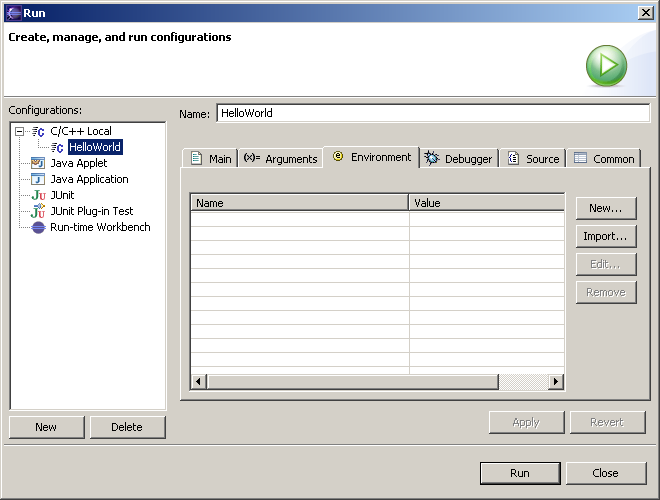 You can set the environment variables and values to use when an application runs. To create a new environment variable, click New. To import an environment variable, click Import. To edit an existing environment variable, select an item from the list and click Edit. To remove an existing environment variable, select an item from the list and click Remove. Type a name in the Name box. Type a value in the Value box. To specify the execution arguments that an application uses and to specify the working directory for a run configuration, see Specifying execution arguments.